An outfit without a hat is like a decanter without a stopper. That’s Ruth Mills’ belief, and she won’t be swayed, even though the Ottawa milliner knows the heyday of hats is definitely over. Long gone is the time when hats were de rigueur and many women even made their own. But, she says, there is evidence of a comeback. "I notice hats more and more. I know it’s my profession, so my eye is going to pick hats out, but I also see more people are wearing hats. People are being braver." You may need a smattering of bravado to don at least some of Ms. Mills’ hats. Her styles run the gamut from elegant to coquettish, smart to outrageous. Her banana hat, for example, is a funky Breton made of beaver fur felt, trimmed with fur and just looking for the right person to wear it with aplomb. Her Valentine’s Day hat is a saucy little number custom-designed and completely hand-made for a client to wear to a cocktail party. Or maybe you’ve got a garden party pending, now that spring is here? "I love straw," Ms. Mills enthuses. "I like to throw something on that’s light, comfortable, airy. Something that protects, but is cool. Although my desire, still, is to create a hat that doesn’t give you hat hair!" The world may beat a path to her door if she succeeds, but for now her clients are "everyday people, people who are not afraid to wear neat hats, who want something unique." 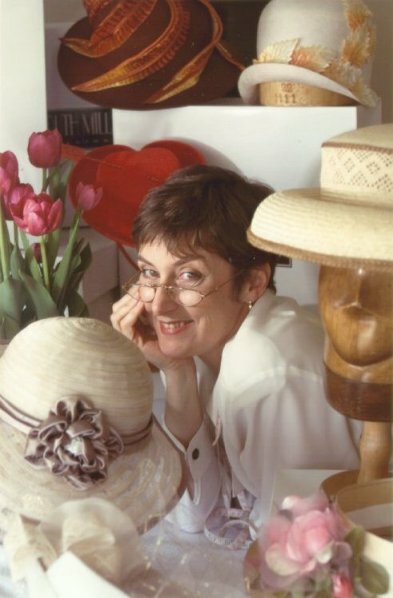 She also has a working relationship with Pakenham designer Paddye Mann, designing hats to complement her line. And Maureen McTeer came to her when she needed a hat to complete a period costume. Others come because they have a special occasion - a wedding, perhaps, a new dress, or a not-so-new outfit in need of a certain something. "It sounds cliché, but a hat completes an outfit," Ms. Mills says. "It’s like a decanter without a stopper." The customer may not even be entirely clear on what is wanted, so where does Ms. Mills begin? "Is it for a wedding? Then I have to ask is it summer or winter" Day or evening" Is it to go with a suit" Will you wear the suit again with the hat?" I have to consider the colours, the materials - felt or fabric, for example. Does it have to be practical - warm or cool, washable? Obviously I look at the person’s face and what kind of personality they have. I may have a style in mind that doesn’t suit the person. If someone has a meek personality, you don’t want a hat that will overpower them." You do pay a price for these creations. A new hat designed expressly for you can cost anywhere from $200 to $450. And up "depending on the complexity of the hat," Ms. Mills explains. "The materials, in general, aren’t expensive. But the labour is very intricate." These are not "hats that you will find in department stores, the milquetoast, run-of-the-mill designs that most people will buy. That is not what I do," she says firmly. At 46, Ms. Mills is a veteran hat maker. For 22 years, she made historic hats for Parks Canada. She decided to cut the bonnet strings when she was offered an administrative position. "I was feeling uncomfortable with that. I have to be able to create something with my hands." She’d had a part-time hat-making business in the late’80s, but packed it up in the ‘90s "for at least five years," she recalls. When she made the decision to leave Parks Canada, she went to have a look at what she’d put aside. That’s when she knew she’d done the right thing. "I could feel the energy growing! I was pulling hats out and saying ‘Oh, I remember this one! I could make another one of these!’ I had to keep myself calm, I was so excited." Ms. Mills still gets excited over the prospect of a new design, a new challenge, although she admits, "There are times when a hat will confound me. It just will not work, and I will stay up all night trying to figure it out." Somewhere along the fashion road, spring came to be associated with hats, with the purchasing of a new "Easter bonnet, with all the frills upon it," as the song goes. Ms. Mills feels it might have something to do with the rebirth people are feeling now. "Everyone is shedding their heavy winter clothes, their old clothes and looking forward to something bright and new." She feels the same way. "I have 11 designs up here," she says, tapping her brow, "for me." She also feels the renewed popularity of hats may have to do with the thinning ozone layer. "Ultraviolet rays may help the rebirth of hats," she acknowledges. "People are much more aware of putting something on their heads for protection. So it might as well be something cool." Ruth Mills’ hats are available through Paddye Mann Designs in Pakenham and Woven Streams Couture in Hull. Or call her directly at 261-1925.